When the weather begins to heat up and it’s time to fire up the grill, dinner almost always calls for a burger. Not just any burger though. Kick things up a few notches and throw in some traditional Mexican flavors, plus all of the fixin’s. And instead of using grass fed ground beef, give ground turkey a try. This will help keep things feeling a bit more light and refreshing on those hot summer days. Most people on a ketogenic diet immediately turn to grass fed ground beef as a go to protein because ground chicken is simply just too lean on a ketogenic diet. However ground turkey is another source of protein with a higher fat content that is great for burgers. It can be far more versatile because it’s more neutral in flavor than beef is and it will easily soak up any flavors you add to it. It also happens to be loaded with a variety of nutritional benefits. Turkey is an excellent source to help meet your protein requirements. Regardless of which diet or way of eating you choose, protein is extremely critical for optimal health. It is needed for your hair, skin, nails, and many processes in your body. On the ketogenic diet, your biggest energy source will be coming from healthy fats though and it is important to keep your protein intake moderate, not high. Finding ground turkey with a higher fat content will not only help you stay in ketosis better, but it will also keep you more satisfied. Be sure to look for ground turkey rather than ground turkey breast, which is a leaner cut of meat. This is an amino acid necessary in regulating sleep. It is needed for the production of melatonin which helps control our sleep-awake cycle. Tryptophan can help manage your psychological health as well. Since it is also responsible for the production of serotonin, a neurotransmitter in the brain, it can balance your mood and help you reduce stress. Another great mineral found in turkey is selenium. This acts as a catalyst for the production of thyroid hormones. Your thyroid is responsible for metabolism, appetite control, sleep, body temperature, weight, and even your energy. It has been found that a deficiency in selenium is correlated with decreased thyroid function. Including foods in your diet that are rich in selenium, like turkey, can help protect your thyroid. The next time dinner calls for a bunless burger, grab some ground turkey on your way home. You may be surprised at just how flavorful this protein source is, especially when you combine it with some zesty Mexican flavors. Mexican food meets burger? It sounds like a match made in heaven. Combine chopped chipotle, salt, pepper, lime juice, cilantro, and garlic powder in a large bowl. Stir well. Add ground turkey and mix well with hands. Portion and divide burgers. Turn on grill or grill pan and coat with non-stick spray. 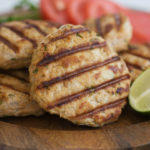 Cook turkey burgers on each side for 2-3 minutes until cooked through. Assemble burgers by adding mayo, avocado, sliced tomato, and red onion.